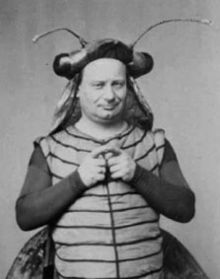 Désiré (29 December 1823 – September 1873) was a French baritone, who is particularly remembered for creating many comic roles in the works of the French operetta composer Jacques Offenbach. Désiré was a stage name; the artist's real name was Amable Courtecuisse, but for most of his life he was generally known as Désiré. He was born in Lille, or a nearby village, and studied bassoon, singing, and declamation at the Lille Conservatory. His first appearances were at small theatres in Belgium and northern France beginning in 1845. In 1847, he arrived at the Théâtre Montmartre in Paris where he met Hervé. He asked Hervé to provide him with a musical sketch (drawn from Cervantes' novel Don Quixote), in which the tall and thin Hervé as the Don was pitted against the short and plump Désiré as Sancho Pança. The sketch inspired what was later dubbed the first French operetta, Hervé's Don Quichotte et Sancho Pança, which premiered in 1848 at Adolphe Adam's Théâtre National at the Cirque Olympique, but with Joseph Kelm, instead of Désiré, as Sancho Pança. In subsequent years Désiré appeared in operetta theatres in Lille, Brussels, and Marseille. He also became a star at Hervé’s Parisian Folies-Concertantes (later the Folies-Nouvelles). Finally he was engaged by Jacques Offenbach for the Théâtre des Bouffes-Parisiens, where Désiré made his brilliantly successful debut on 16 May 1857 in Vent-du-Soir, ou l'horrible festin. Thereafter until 1873 he remained one of the star actors of Offenbach's company, appearing in many of the premieres of Offenbach's most famous operettas. His greatest success was his unforgettable portrayal of the role of Jupiter in Orpheus in the Underworld, which premiered on 21 October 1858. Désiré also appeared at other Parisian theatres, including the Théâtre des Variétés, the Théâtre du Palais-Royal, and the Athénée-Musicale, and also worked with the French operetta composer Charles Lecocq. At the end of his career Désiré became increasingly addicted to alcohol and died, abandoned and in poverty, in Asnières-sur-Seine. 1861: Choufleuri in M. Choufleuri restera chez lui le . . . In 1867 he also appeared at the Théâtre des Nouveautés as Sganarelle in La statue du commandeur. ^ a b c d e f g Kutsch, K. J.; Riemens, Leo. Großes Sängerlexikon (fourth edition, in German), p. 1130. K. G. Saur, Munich, 2003. ISBN 978-3-598-11598-1. ^ a b c d Gänzl K. The Encyclopedia of the Musical Theatre. Blackwell, Oxford, 1994. ISBN 978-0-631-16457-9. ^ a b Traubner, Richard. Operetta — a theatrical history. Oxford University Press, Oxford, 1983. ISBN 978-0-385-13232-9. ^ Walsh TJ. Second Empire Opera – The Théâtre-Lyrique Paris 1851-1870, pp. 359–360. John Calder Ltd, London, 1981. ^ Yon, Jean-Claude. Jacques Offenbach. Editions Gallimard, Paris, 2000. ^ Delibes, Leo (1876). Le serpent à plumes (piano-vocal score). Paris: Colombier. IMSLP file #31045. ^ a b c d e f Parsons, Charles H. Opera Premieres: An Index of Casts/Performances, p. 406 Volume 15 in the series The Mellen Opera Index. The Edward Mellen Press, Lewiston, New York, 1993. ISBN 978-0-88946-414-8. ^ Blangini fils, probably the son of Joseph Marie Felix Blangini (see Short biography at Wikisource). This page was last edited on 10 February 2019, at 02:26 (UTC).